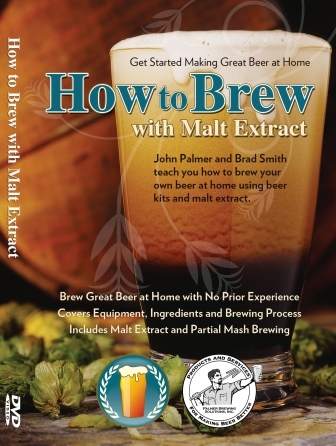 John Palmer and I are pleased to offer you “$5 off” the digital preorder for our new video “How to Brew Beer with Malt Extract”. The video will be released next Monday, the 30th of June 2014. It will also be available on DVD from Amazon and in many home brew stores in early July. It makes a great gift for anyone interested in getting into home brewing! The video, developed for new/beginning home brewers, walks you through brewing your first batch of beer from start to finish. The video features John Palmer, the author of the top #1 selling home brew book “How to Brew” and Brad Smith, author of BeerSmith. Its beautifully filmed using hundreds of detailed shots showing every step in the brewing process. We’re offering it at a preorder discount of $5 off the regular price for the digital version – so grab your copy today! I hope you enjoy the new video. Please be sure to subscribe to my newsletter to receive updates on our second video, “How to Brew All Grain” which will be available in September for more advanced brewers.